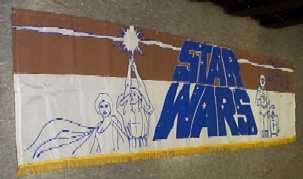 Although its not really a poster, I've placed this banner in the "posters" section due to its affiliation with the many theatrical posters issued for the first three Star Wars films. 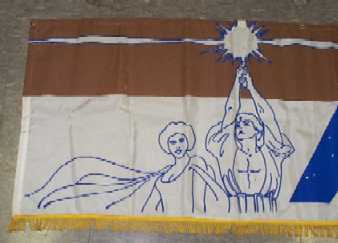 Very few theaters received these banners, and today they turn up on the collector's market quite infrequently. Personally, I think its a weird piece; the colors are unprecedented and the line art is kind of goofy. Still, its got a certain charm to it. Here you see an interpretation of the Luke/Leia pose made famous by the "Style A" Star Wars poster. And here we have the two droids, R2-D2 and C-3PO. Gotta love that triangular "nose" they gave to Threepio. 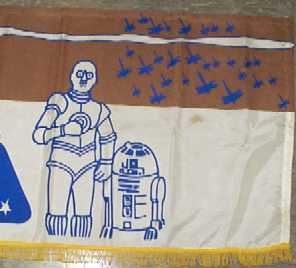 My favorite portion of the banner is the pyramidal logo, which was used on a lot of early licensed products. I think its one of the most dynamic Star Wars logos ever, and it looks great here.